The Light Yoga Space has a flowing amazing team of dedicated Sivananda yoga teachers. I had a dream to open a beautiful live/work yoga studio, purely focused on Sivananda yoga. I wanted the studio to be light, calm, welcoming and peaceful. In 2008 I took one of Peter Vestergaard’s classes at the Sivananda Centre and loved it and asked him at the end of class if he would like to open a yoga studio with me. He said yes and the seeds of Light Yoga Space were sewn. Together we searched London for about a year for the right location, finally stumbling upon the treasure that is Unit B, 100 De Beauvoir Road, our first ever home. The Light Yoga Space was born and Peter and I ran the studio together for 6 years until he moved on to pastures greener in Kent with his partner and I continued to run the Light Yoga Space myself. 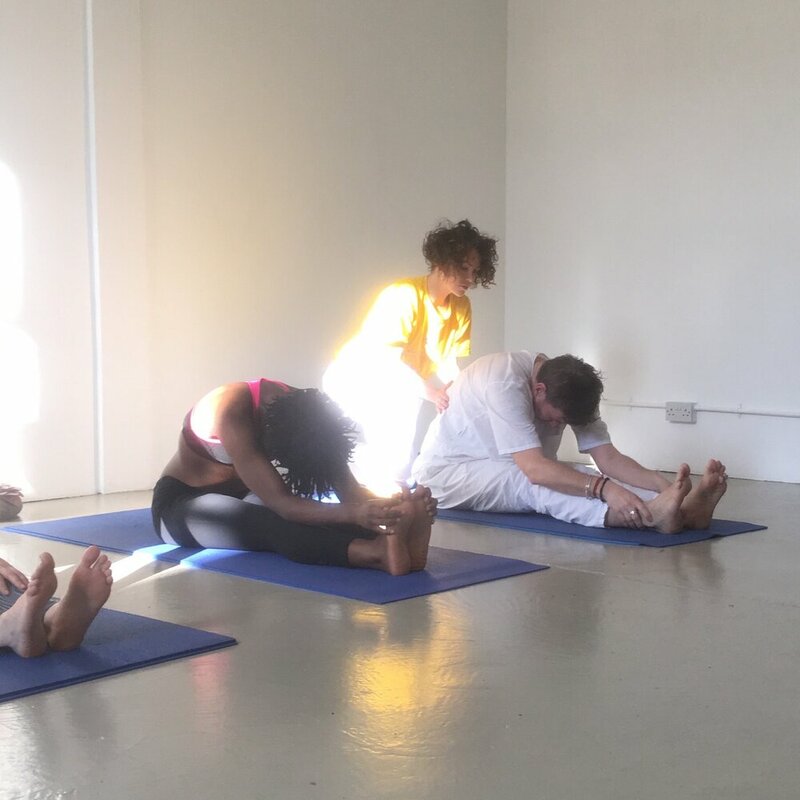 In April 2019 I was joined by Sarah Benjamin as co-owner of Light Yoga Space and we moved the yoga school to Arcola Street. My focus areas as a yoga teacher are working with self-acceptance through non-competitive practice, working with people in larger bodies, and the healing potential of practicing yoga in the presence of animals. I am passionately vegan and am a trustee for Friend Farm Animal Sanctuary a registered charity in Kent no. 1173318. Hi I’m Sarah and as of April 2019 I became a co-owner of Light Yoga Space. I have been a regular yoga practitioner since 2008, qualified as a yoga teacher in 2011 and I have been teaching yoga ever since. My yoga story started after realising that my body and the gym were really not the best of friends. I developed a knee injury and realised that I had to take a more gentle approach with my body. Yoga therefore, seemed like the natural option because as far as I was aware then, it was a practice that had the ‘gentle’ approach I was looking for. I started practising by myself, with a book and some videos as a guide and to my surprise, yoga was really challenging yet beautifully nurturing at the same time. Practising made me feel strong, yet light and rejuvenated. It really felt good. I also loved that all I needed was a mat and my own body - no other equipment required. During the throws of beginners-ship, I did start to wonder whether I was actually doing it right! Based on that, I decided to search for some local classes. While looking for places to practice, I discovered the Sivananda Yoga Centre in London in 2005. I did my first ever beginners course there and I really enjoyed it. After I completed this course I realised that I now had licence to attend any of the drop-in classes available but somehow, that felt daunting. Looking back now, I had absolutely nothing to worry about, but it was enough to put a dent in my practice for a while even though the thoughts of how yoga made me feel never ever went away. I reignited my practice again in 2008 and started to practice a lot more regularly and also help out at the centre as a karma yogi. I was, and continue to be inspired by the holistic approach of the Sivananda tradition and felt a strong connection to the teachings and philosophy that it presented. I eventually took the Sivananda Teacher Training course in 2011 and started teaching shortly after qualifying. I developed my experience in teaching beginner and intermediate classes, advanced, senior, pregnancy classes, as well as basic meditation techniques. After some time, I started to teach private clients and was looking to teach in yoga studios. It was during this time that I met Janice and the Light Yoga Space team. I had the absolute privilege of teaching at the previous studio in De Beauvoir Town for almost 3 years before the move to our current home in Arcola Street. Alongside this, I work part time as an IT teacher and coach and I am passionate about education and self development as I believe we all seek one or both of these at some point in our lives. I have an 18 year career of working in an inner city college and I draw on my experiences of supporting people from all walks of life to help with my yoga teaching and championing the inclusivity of the practice. 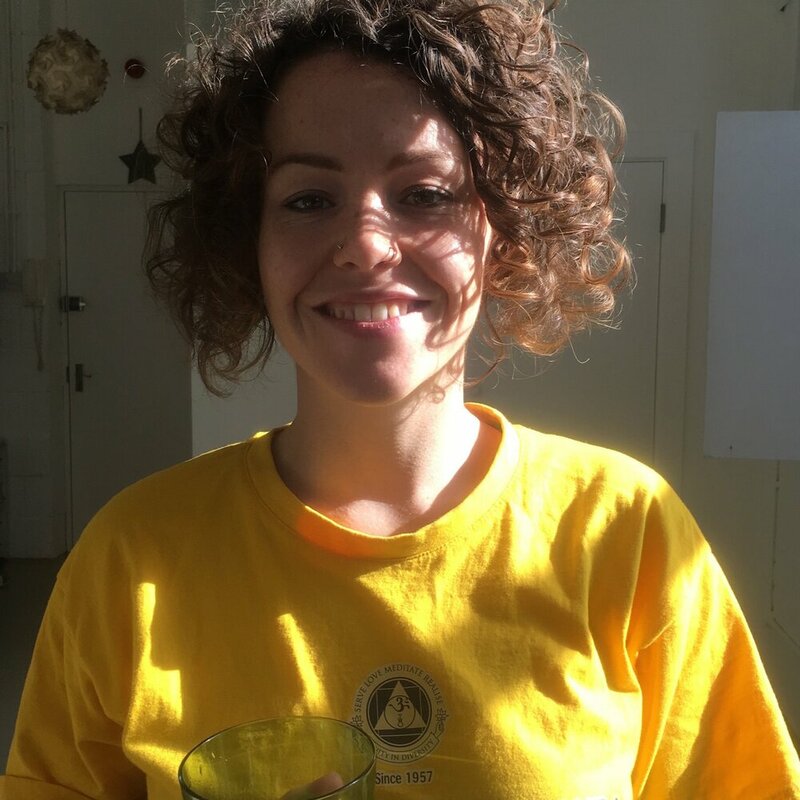 Naomi has been practicing yoga since 1999, and since we opened in 2009 she has been practicing exclusively Sivananda Yoga with us here in Dalston at the Light Yoga Space. Naomi practices with commitment and discipline, she caught our attention right from the start with the strength and discipline of her own practice and her obvious love of yoga. Naomi first discovered yoga in 1999 while studying at university but it was in 2006 that she really started practicing with dedication. In 2012 she completed her teachers training course with the Sivananda Yoga Vedanta School. Naomi is a lawyer by day and draws on her yoga practice to keep her centred and focused in the office. 'I stumbled upon Sivananda Yoga when I moved to London in 2015. The Light Yoga Space sits conveniently at the end of my road and offered a 30 day trial. Little did I know those 30 days would have such a profound impact on my life! "Bitten by the yoga bug" I attended classes most days for 18 months and felt a strong sense of calm and peace that offset the energetic hustle of London. I have always been active, enjoying over 10+ years as a basketball player, but working with pranayama and the asanas I have been able to relieve long held tension and find space in my body and mind. In June this year I completed my Sivananda Teacher Training Course in Putney, and combining my experience working with young people in theatre, the criminal justice system and social care, I have keen aspirations to teach Traditional Sivananda yoga in theatres, prisons and children's homes. I am so happy I found the Light Yoga Space and am thrilled I am able to teach at the studio! Harriet began a regular practice of Sivananda yoga many years ago as a counterbalance to a busy and stressful professional life as a mediator, charity manager and fundraiser. Having left London to travel India and Asia in 2009, she took the opportunity to complete the teacher training course in Uttar Kashi, in the Himalayas, thus fulfilling her dream to teach yoga and share the benefits with others leading busy and often stressful lives back home. Harriet has been teaching ever since. A sensitive and gentle teacher, Harriet helps her students focus on the here and now, relaxing body and mind while they actively stimulate their body's inherent well-being. 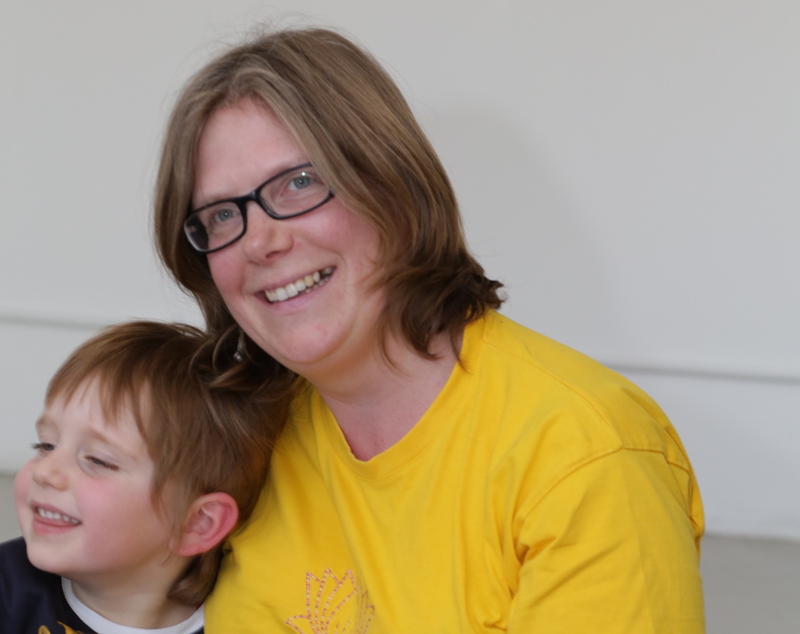 Harriet completed additional Pregnancy Yoga training in Austria in 2012 and will complete training and start teaching yoga for children in 2015. She also works as a translator (recently translating the 'Yoga for a relaxed pregnancy' book, the guide to Ayurveda and Sivananda yoga for pregnancy) and makes children's clothes when not looking after her young son. Ishwari began life as a nationally competitive gymnast in the US for 11 years, where she was periodically exposed to yoga for “stretching purposes” by her coaches, but also by her parents who fortunately introduced her to meditation as a means of handling stress. She was very much supported by her family when she announced she was going to live on an ashram following university. Knowing nothing about Sivananda yoga, Ishwari found herself at the Sivananda Yoga Retreat in the Bahamas based on a recommendation where she completed her TTC in 2011. She then went on to finish ATTC at the Sivananda Yoga Ranch in New York in 2013, where she also took part in her first sadhana intensive in 2014 and has been a regular karma yogi ever since. Peter was one of the original co-founders of Light Yoga Space. Physical activities have always been a big part of Peter's life. As a child and teenager he practiced gymnastics and swimming in his native Denmark before he took up ballet and contemporary dance. He moved to the UK in 1999 to study at the Rambert School of Ballet and Contemporary Dance in London. During his dance studies he discovered the practice of Yoga which became a very helpful tool to release physical and mental tensions, along with aching muscles, in this period of intensive physical training. With the passing of years the practice of Yoga became an increasingly important part of his life and began to influence his lifestyle. After graduating from Rambert, Peter went on to take the Sivananda Yoga Teacher's Training course in 2006. He studied at the Uttarkashi Ashram in the Himalayas and extended his stay there to teach and work as a volunteer. Since returning to London he has taken numerous courses of further training both in the UK and overseas including Yoga Nidra (deep relaxation) teacher's training and Teaching Yoga to seniors. Peter teaches with warmth, empathy, humour and passion. He is convinced that Yoga has something to offer to all and this, along with his values as a person are woven through his ways of working with people. He ensures students are guided according to their level of practice, takes time to understand their goals and will challenge their self-imposed limitations which can prevent people achieving their full potential. Adrianna is one of those quietly determined, born to be, yoga teachers, she appeared on the Light Yoga Space doorstep just under 4 years ago and in an intensive bid to own yoga we've practically seen her every other day since, she actually participated in 198 classes at Light Yoga Space between December 2014 - December 2015. She completed her Yoga Teacher Training in Reith Austria at the Sivananda Retreat House in January 2016 and has since gained experience teaching at several spaces across London. Adrianna keeps a dedicated asana and meditation practice which she began four years ago. Adrianna's interest in teaching and practicing yoga explores the benefits of how a regular practice can help maintain a healthy lifestyle not only physically but also how yoga can help the mind, how it assists with depression, anxiety and stress. Besides teaching yoga, Adrianna is an artist working in video, sound and installation, she studied a BFA in Sculpture in Canada, where she is originally from and an MFA in Fine Art at Goldsmiths in London. Adrianna is a Lecturer at the University of the Arts London where she has taught studio and theory based courses and is also currently studying an MA in Academic Practice. Adrianna's love for yoga and art often cross paths with each other in relation to exploring how the practice of yoga can help with opening one's creativity and how yoga can be a helpful tool in terms of looking at academic practices that embrace ideas of freedom, self-realisation and acceptance. Anjaneya discovered yoga in 2007 and two years later took his teacher's training course in Neyyar Dam, India. Since then he has been dedicated to practicing and teaching yoga in the Sivananda tradition. Anjaneya has spent the last 6 years teaching and serving in the London Sivananda centre whilst working as a fundraiser for an international NGO. He has returned to India many times since his teacher training to deepen and further his understanding of the Sivananda tradition, most recently completing the Sadhana Intensive course for the second time. Swami Vishnu's statement "Health is Wealth, Peace of Mind is Happiness, Yoga shows the way" has been central to Vernon's practise and lifestyle of the last several years. Emma has been teaching yoga, meditation and philosophy now for more than 20 years. She took the Sivananda yoga teachers training course in Neyyar Dam, India in 1994 and her advanced teachers trainings in the Sivananda headquarters in Canada and in Rudraprayag, Himalays in India in 2000/2014. She met Swami Vishnu Devananda, the founder of the Sivananda organisation, in 1993, and then stayed on as full time voluntary staff with the organisation for the following 14 years doing service and spreading the beautiful message and teachings of yoga. During her time as staff she directed the Paris, New York and Delhi Sivananda centres for several years, and has an in depth training and experience in all aspects of yoga practice and philosophy. 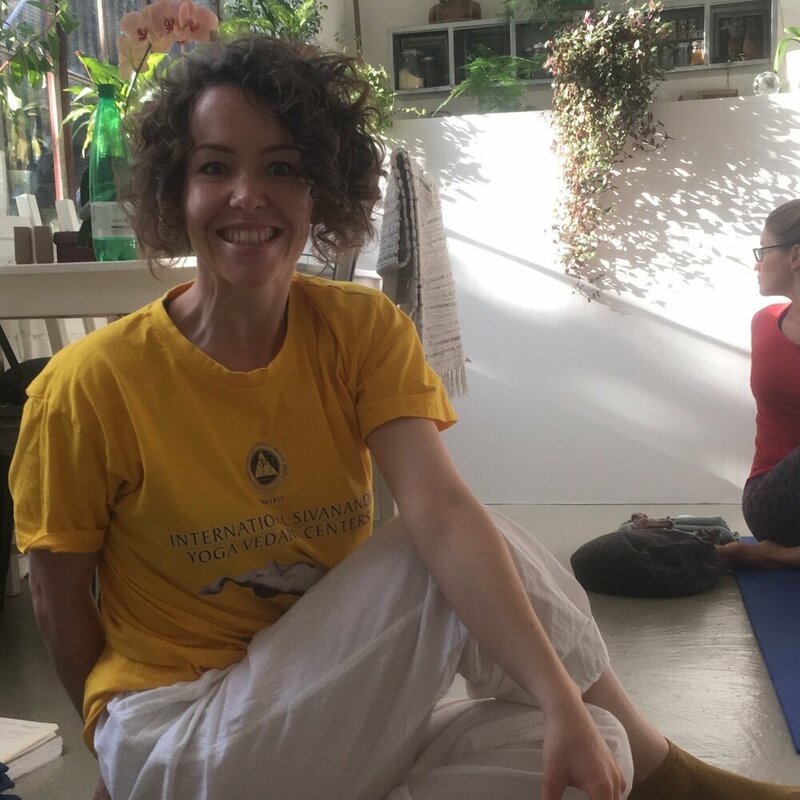 She has also been a teacher on the Sivananda Teachers Training Courses and is now a regular teacher of meditation and philosophy on the Yoga London Teachers Training Courses and teaches classes regularly in Bromley and North London and runs ongoing yoga retreats. Emma is a qualified ayurvedic nutrition and lifestyle consultant and an ayurvedic massage therapist and guides people on all issues of health, wellbeing and positive living. "Yoga sprung into my life at drama school in 2002; where my stiff, egotistical 18 year old self was encouraged to take yoga classes to help authentically connect to my body. I loved the movement, loved the focus and I loved the way I felt after a class. I vowed there and then to keep the practice in my life. Fast forward 8 years and I found myself working as a female broker in the mayhem and aggression of the City of London - suddenly yoga became an absolute necessity. It became my salvation, my 1.5 hours where I detached from the outside world, detached from the sensory overload and connected back in with my soul. Having been an avid sweat addict all my life; chasing weights, treadmills, astanga and vinyasa, the calm of Sivananda was a revelation! For the past 5 years I have had the joy of practising at The Light Yoga Space and was over the moon to finally take my teacher training at the Sivananda Ashram in Austria in 2015. For me, Sivananda is about simplifying my life; through a sequence of beautiful body opening postures, mind focussing breath work and deep relaxation. The practice of Pratyahara - withdrawal of the senses - is something that really resonated with me in my training. The fact is, us Londoners lead hectic, overly stimulated lives resulting in spectacular burnouts! And as a new teacher and continual student I can only hope to bring a little bit of that peace to fellow yogis in training. She has one arm 2inches longer than the other but can still hold crow! All bodies can practise yoga, no matter their shape and design!